The marathon is secondary at the Mumbai Marathon. Don't let the supersonic Ethiopians fool you. The Dream Run, a 7 km charity run/walk, is the real ticket on marathon Sunday. I thought this was a bit annoying at first--hey, guys, I'm running the marathon, look at me! LOOK AT ME!--but I warmed up to the fact as the day itself warmed up. The day took time to warm up. The marathon for humans started at 6:15am, which meant getting to the Chembur train station before 5:00am, which meant, well, early. (The superhumans, the Elites, started later at 7:45am.) The guard at the gate of the housing complex was asleep. The drivers were asleep in their taxis. People slept on and below the counters at the train station. The chai stall was the only sign of life on the street. Priorities, priorities. The pulse was quicker in Mumbai proper, nearer to the Azad Maidan where the marathon runners assembled. Fences along the race route separated us from our destination. Security men in black walked arm-in-arm along the route, practiced clearing the course. Perhaps in Mumbai, the runners like to stage riots. I was hoping for a chance to say that the marathon staging area was chaos. It wasn't. The baggage check area was clearly marked, and so was the gate to the starting line. But, runners, what's the most important station before the race? Yeah. The toilet. Where was it. Pradeep asked the baggage guy where it was. He pointed across the Maidan. I ran over there, one or two hundred meters, but there were only corporate tents there. (Maybe he wanted me to send them a message?) I ask a guy at the corporate tent. He points to another part of the Maidan. I run there--refreshment tent. I ask another. He points. I run. Medical tent. Ask another. He points behind the refreshments tent. I go there. Whoa, hey guys, sorry, I'll let you do your thing.. I ask another guy, he points, I run--bingo. It wouldn't be India without a series of a half dozen conflicting directions. Through the gate and to the street. In the distance the announcer is going mad with enthusiasm, as a good announcer should. He even congratulated the contingent of Maharashtra state officials for waking up so early to see us off. Indeed. Congratulations, guys. Drink plenty of water and don't overdo it if you're feeling exhausted. And then we were off. And by "we" I mean "the other people who were on time and at the starting line." The rest of us were still wandering up the dark street. It wouldn't be Kirk Kittell without a late start. I was running for Muktangan, an educational group in Mumbai. They're a very cool organization, and shouldn't be construed with any of my silliness. To help them out, I ran as a human billboard, sporting the same hat and polo shirt that their participants wore in the Dream Run. Yeah, I ran a marathon in a polo shirt. And an undershirt. If I was going to run in front of a bunch of cameras, I wasn't going to put my chest hair on display through a wet, white shirt. In the fight between heat stroke and vanity, I chose vanity. 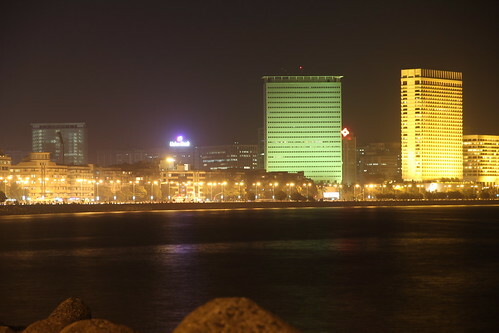 Our first stop, figuratively, was Marine Drive--the Queen's Necklace, a sweeping curve of streetlights that draw an outline of the bay in the dark. We were early. The states on the sidewalk were empty, TV camera stations stood unmanned, spectators were sparse. The only noise on the street was a band tuning and warming up, our feet, and a DJ from Radio Mirchi 98.3 trying his best to compensate for the vocal void. At 44 minutes the sky was bright, and the half marathon leaders came charging by us. 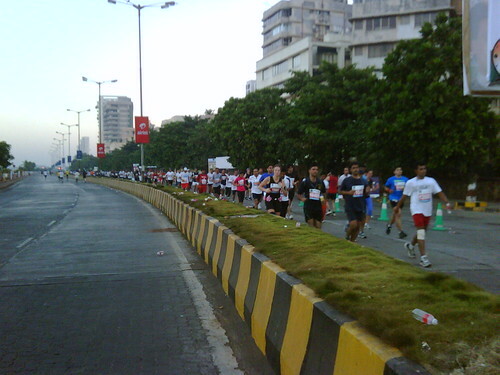 They started at Bandra, on the far end of the marathon course. They got to explore the Bandra-Worli Sea Link during the mild dawn--more on that later. At 45 minutes I reached for one of the four gel packs I brought from home. At the Chicago Marathon I carried them in my hand, but in Mumbai I had a brilliant idea: I used athletic tape to secure them to the waistband of my shorts, two in front, two in back. I was worried that the bouncing would cause me to excrete the gel packs from my shorts, so I taped them securely. Very securely. For three full minutes I fought with the tape, at first pulling and then flailing at the back of my shorts, before I finally extricated the gel pack from myself. ("Say, what is that running white guy doing there? What strange customs they have." ) Body-warm vanilla: it's what's for breakfast. OK, right--the race. At the one-hour mark, we marathon runners were quite dispersed, big gaps of tens and hundreds of meters separating us. It is a very strange experience to have ample personal space in Mumbai. Ride a rush hour train or bus in Mumbai some time--it is a serious Cultural Experience. We weren't alone for long. Soon the great mass of half marathon runners was streaming past us. Half marathon runners, congratulating themselves for not signing up for the full marathon. And then they became us. 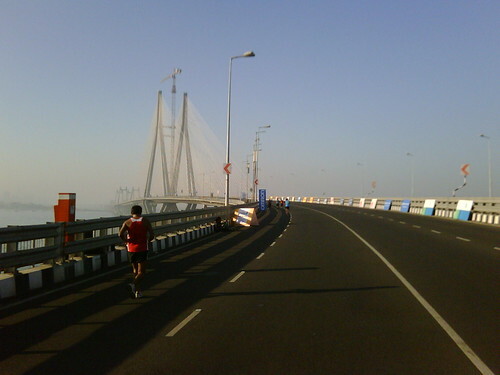 At 1:12 the half marathon runners started pouring in from the Bandra-Worli Sea Link on the left, merging with us--great news for the lonely, but not so great if you wanted to run without dodging through slower-moving bodies. Chaos, chaos for three kilometers, then we separated to the left and rediscovered solitude on the streets of Mumbai. Skip the following paragraph. It is not for Respectable People. I made it to 20 km at 1:41:20. There I stopped to peruse the portable facilities. (If you're a runner, you understand, yeah?) There were two. Behind door #1: no latch. No thanks. I only allow spectators on the race course. Behind door #2: No latch. Um. I'm not one to skip opportunities, so I asked the marathon staff member, a young guy, to hold the door shut for me. He shuts it, holds it for a while, walks away, then slides something heavy in front of it. OK. Outside, through the cracked door, I see him reach into a pail, grab a roll of paper, wipe his hands. Immediate alarm bells--that's my lifeline out there. He replaces the roll, I reach out through the crack to acquire it, etc. I opened the door, emerged, and the pail of something white (milk?) that was stopping the door spilled over onto the pavement. As if in a choreographed routine, the staff guy and I look at each other, slowly look down at the spreading spill, then share the universal glance for, "Well, that was crazy now, wasn't it?" OK, no more stories like that. Past the halfway mark at 1:50, and the crowd had finally rolled out of bed. There were people on the streets before that--and those people were saints, those few who helped us pass the early miles--but now a Crowd had arrived. Since the marathon runners were separated from each other, the crowd turned their cheering on and off as we approached and receded. In these crowds I heard a few India-specific kinds of congratulations, "Come on uncle, come on uncle," or "Good job sir, good job, sir." We entered the Bandra-Worli Sea Link. Some of us returned. The Bandra-Worli Sea Link. Looming. 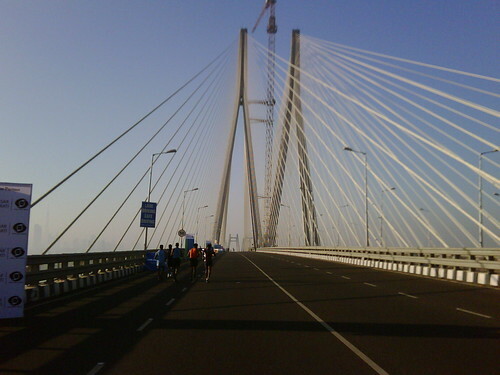 The Bandra-Worli Sea Link is a landmark bridge in Mumbai. It is beautiful, something visitors to Mumbai must see, and it was a pleasure to see it from the ground. I passed a few runners from the Runners for Life running club in Bangalore. They'll also be at the Auroville Marathon, near Pondicherry, in February. They offered me a trade. They allowed me to beat them in Mumbai, but they offered me a beer if I'd lose to them in Auroville. I'm holding you to it, guys. It was also a five or six kilometer slog through the sun. The slower runners, who would have crossed it when the sun was higher, hotter, have my sympathy. After the bridge, I don't have much to say. I don't remember much. Marathon runners know: from 32 km on, the world gets a little weird. Let me tell you: it's the same in India as it is at home, but maybe a little weirder. Past 32 km (that's 20 miles, my imperialist friends), the key word is Survival. I'll skip it here. people were yelling--chaos, chaos, but in the best possible way. At 39 km, there was an especially large amount of hubbub coming from behind, motorcycles passing us, people buzzing. And there they were. Runners. Super-runners. I had never, ever seen them in person, up close. The marathon leaders. Needless to say, I don't spend much time at the front of the pack, so the staggered start was a unique opportunity to witness them in action. They ate us amateur runners up like wolverines. They sped past like a pack of missiles. It was a beautiful experience to be annihilated so thoroughly. At 41 km I passed Udaya. I had been following him for a kilometer or two, and he was enjoying the race as it should be enjoyed--arms in the air like a victor, calling back to the crowd, bouncing from side to side to give high fives. If you're not going to win, that's how you run a marathon. Where did he get the energy? I was focused almost solely on maintaining a non-grimace. As I turned off Marine Drive and passed him, I put my arm around his shoulders and encouraged him to keep going, and he reciprocated. I'm wary about doing things like that to runners that I pass--I don't want to make it seem like some kind of ego stomp, some salt in the wound as I go by. I just wanted to say thanks for being so entertaining. We talked after the race, and I'll see him also at the Auroville Marathon. I talked to Amal, from Glenmark, who was running for Yuva Parivartan, and he said it best. "It's good to see people come together to make a difference in good times instead of during a tragedy." The Mumbai Marathon isn't a world class marathon. It's not. Don't let the 2:09 winning time fool you. Maybe it will grow into one, but it's not there yet. The Mumbai Marathon is the Dream Run, with the marathon appended to it. But that's OK. I was asked after the race if I'd come back and run the marathon again, and I said, honestly, "Yes." This entry was posted in Race report and tagged India, Mumbai on 2011-01-16 by kirk.kittell. Dream run is more like a walk many go in groups and just finish it .. just to be there for a cause...many senior citizens also participate. you are experiencing life across the world!!! US in order ??? this snow is keeping me in order 😉 already injured my ankle when I was running to catch a train and fell hard on the "Black Ice"..and learnt the lesson hard way! still lot of snow to come. I hope the chinese president visit goes well and people are fighting for the health repeal. I pity the health care because it is called an industry and runs 'public health "care"' as an industry!!! Just go to any hospital or a clinic in India it is so simple process. The cost of chemotherapy is much cheaper in India than a mere hospital visit here in US. Were you talking too much? No, no. Talk as much as you like. I spend too much time alone while traveling, so it's nice to have the conversation. I have to admit that I don't really understand health care. Not at all. I've been fortunate to keep my health. The way people go about discussing it the various media is often vicious, and I don't find it interesting to learn more about it.